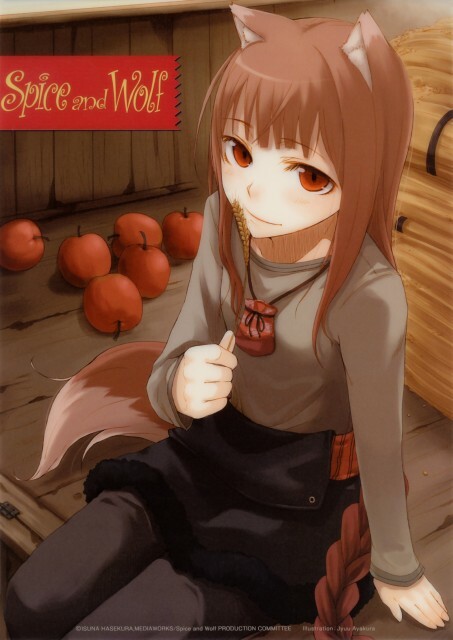 Tagged under Spice and Wolf, Red Eyes, Brown Hair, Long Hair, Ookamimimi, Waifu, Tails. Horo (or Holo) is known to the population of a village as the god of rich harvests. Although in the legend among the people her actual form is that of a large wolf, she mainly takes the form of a pretty young girl with white tipped wolf ears and tail, which she particularly pays special attention to. Although Holo was previously revered by the village, they no longer heed her as they used to. So, she made a deal with a traveling peddler to return to her original home in the north known as Yoitsu.